Atomically thin 2D semiconductors have been drawing attention for their superior physical properties over silicon semiconductors; nevertheless, they are not the most appealing materials due to their structural instability and costly manufacturing process. 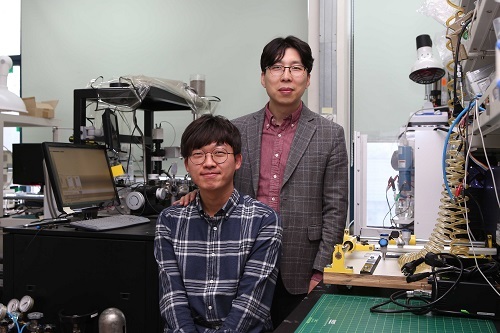 To shed some light on these limitations, a KAIST research team suspended a 2D semiconductor on a dome-shaped nanostructure to produce a highly efficient semiconductor at a low cost. 2D semiconducting materials have emerged as alternatives for silicon-based semiconductors because of their inherent flexibility, high transparency, and excellent carrier transport properties, which are the important characteristics for flexible electronics. Despite their outstanding physical and chemical properties, they are oversensitive to their environment due to their extremely thin nature. Hence, any irregularities in the supporting surface can affect the properties of 2D semiconductors and make it more difficult to produce reliable and well performing devices. In particular, it can result in serious degradation of charge-carrier mobility or light-emission yield. To solve this problem, there have been continued efforts to fundamentally block the substrate effects. One way is to suspend a 2D semiconductor; however, this method will degrade mechanical durability due to the absence of a supporter underneath the 2D semiconducting materials. Professor Yeon Sik Jung from the Department of Materials Science and Engineering and his team came up with a new strategy based on the insertion of high-density topographic patterns as a nanogap-containing supporter between 2D materials and the substrate in order to mitigate their contact and to block the substrate-induced unwanted effects. More than 90% of the dome-shaped supporter is simply an empty space because of its nanometer scale size. 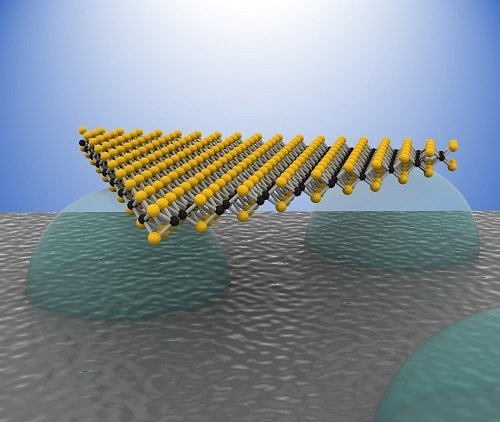 Placing a 2D semiconductor on this structure creates a similar effect to levitating the layer. Hence, this method secures the mechanical durability of the device while minimizing the undesired effects from the substrate. By applying this method to the 2D semiconductor, the charge-carrier mobility was more than doubled, showing a significant improvement of the performance of the 2D semiconductor. Additionally, the team reduced the price of manufacturing the semiconductor. In general, constructing an ultra-fine dome structure on a surface generally involves costly equipment to create individual patterns on the surface. However, the team employed a method of self-assembling nanopatterns in which molecules assemble themselves to form a nanostructure. This method led to reducing production costs and showed good compatibility with conventional semiconductor manufacturing processes. This research, led by PhD candidate Soomin Yim, was published in Nano Letters in April.